FISHERS, Ind. (WXIN) – Marsh Supermarkets Inc. said it plans to close two supermarkets in central Indiana. Both stores have leases that expire soon. Officials at Marsh confirmed the impending closings in Columbus and in Marion. A confirmed source says March 9 is the final day of operations at the Marsh Supermarket, 4512 South Adams Street in Marion and the Columbus Marsh Hometown Market Store at 2710 State Street. The closures will leave one Marsh store in Marion and Columbus. Marsh officials say intends to grant as many employees as possible a severance package or give them the opportunity to transfer to other locations. The closures will leave Marsh with 91 stores in Indiana and Ohio. About 45 percent of those are in the Indianapolis area. 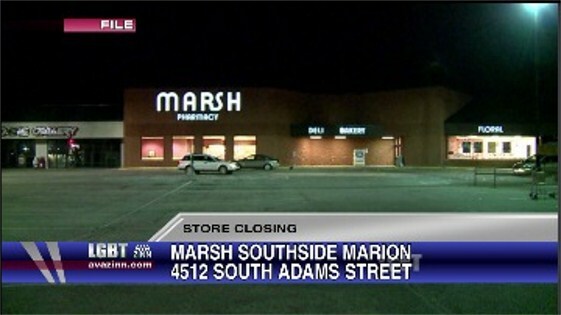 Marsh closed a Main Street market in Wabash and three Marsh Supermarkets in Anderson, Greenwood, and Martinsville in 2012 and three others in 2011. WEBMASTER’S NOTE: The affected Marsh Supermarket in Marion is located in the No IWU Zone. The last item purchased at the particaular Marsh store was a package of hamburger buns for $1.29 in August 2001. The first item ever purchased at the Adams Street store was a TV Guide magazine for 50 cents.